Hitomi Kanzaki (神崎ひとみ, Kanzaki Hitomi?) is a 15 year old high school student on her high school track team. She's a bit different from her classmates because of her fascination with tarot cards and fortune-telling. She received a set of tarot cards and a mysterious pink pendant from her grandmother when she was just a small child. When Hitomi learns that her crush, Amano Susumu, will be leaving to study abroad, she asks him to kiss her if she can sprint 100 meters in 13 seconds. Before she can make it to the finish line, a bright pillar of light appears before her. The pillar of light transported Van Fanel and the dragon he was fighting from Gaea to Earth. After Van successfully slays the dragon with the help of Hitomi, she ends up getting transported to Gaea with Van. During Hitomi's time in Gaea, her psychic powers become evident and extremely important. Her powers allow her to find people or destinations through dowsing and accurately read the future through tarot card reading. This ability proves to be very useful when she and Van are fighting against the invisible guymelefs from Zaibach. Hitomi also discovers that she can change or stop Emperor Dornkirk of Zaibach's visions of the future. On occasion, Hitomi can unwittingly summon pillars of light capable of transporting herself and others to other locations. Throughout the series she is torn between romantic interest in both Allen Schezar and Van Fanel. When she first arrives in Gaea she immediately notices the similarities in looks between Allen Schzar and her crush Amano Susumu. Because of their similarities Hitomi quickly falls for Allen. This new crush creates romantic tension when she realizes that she is actually in love with the King of Fanelia, Van Fanel. Van Fanel (バァン・ファーネル, Van Fanel?) is the young king of Fanelia, the second son of King Goau and Queen Varie. Varie was a Draconian, winged people descended from the people of Atlantis. The Draconians were stigmatized and believed to be bearers of bad luck. At a young age Van was cautioned against carelessly showing his wings, a mark of his Draconian heritage. When Van was 5 years old, his father died of unknown cause and his older brother, Folken was required to claim the kingship. In order to do, he first had to slay a dragon, but he never returned and was presumed that he had either died fighting the dragon or lost his nerve and fled. Van's mother grew ill from worrying about Folken, and went out into the night to search for him in the forest where he was supposed to complete his task. Her body was never found. Balgus, a trusted knight of his father's, returned after a long absence and became Van's surrogate father. When Van was fifteen, he performed the rite of dragonslaying. During his battle with the dragon, however, he and the dragon were mysteriously transported to Earth, where he first encountered Hitomi. After he killed the dragon, he was taken back to Gaea, with Hitomi being transported with him. During his coronation as King, the Zaibach Empire attacked Fanelia. 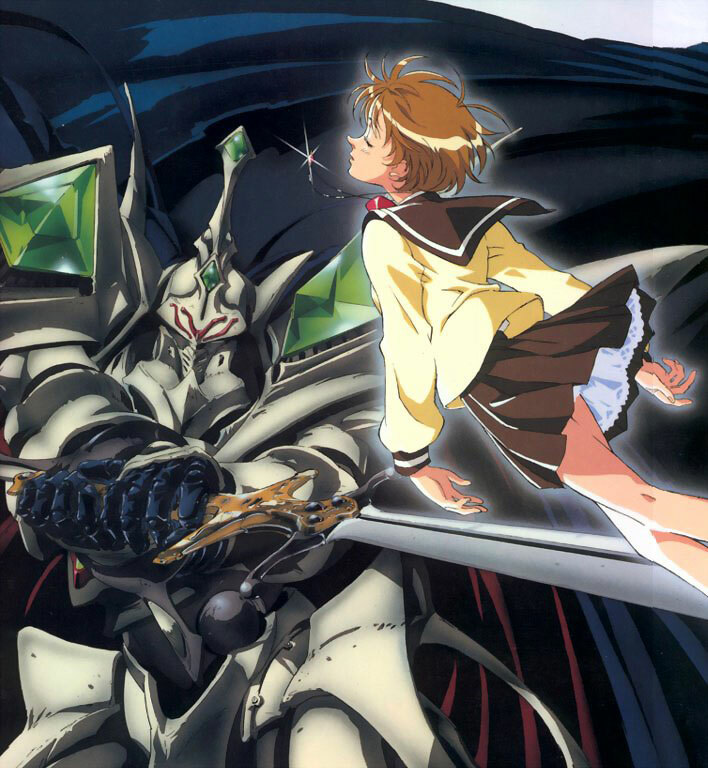 Van activiates the kingdom's greatest treasure, a Guymelef named Escaflowne. 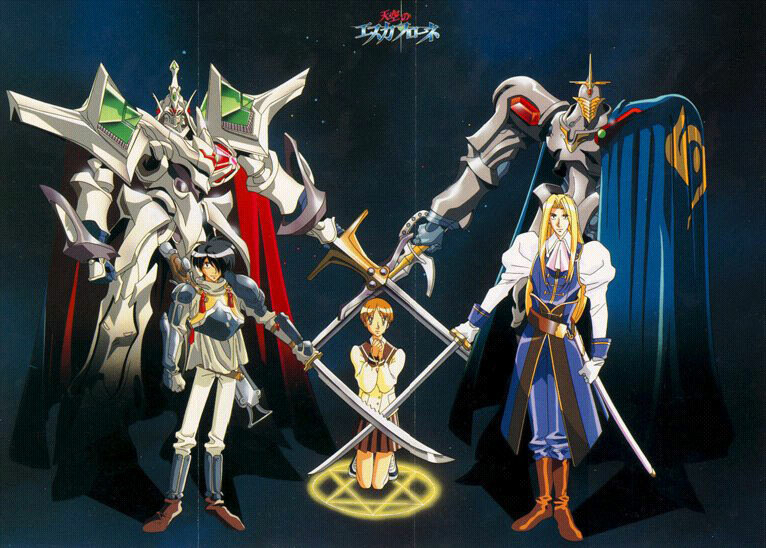 To activate the system, Van forms a blood pact with it, tying his own life to Escaflowne when he is piloting it. Though Van wants to protect his kingdom with the powerful machine, he is forced to flee his kingdom with Hitomi, only to learn later that Fanelia was burned to the ground by Zaibach. During the beginning of the series Van was frequently told that his attacks weren't "aggressive" enough, Van's reasoning being that he didn't like bloodshed or the thought of killing someone. After he stated this, he was told that as a king of Fanelia this was not an appropriate point of view and that he would have to fight regardless of his feelings. However, as the anime progresses and Van's misfortune only increases, he becomes bent on revenge and begins to enjoy battle to the point of engaging in a seemingly "fight to the death" match with his comrade Allen. Yet, his love for Hitomi proves stronger than his love for battle and he eventually removes Escaflowne's energist stating that he would like to see a future where Escaflowne isn't needed. His destiny and Hitomi's are linked, and he is initially dependent on Hitomi's clairvoyant abilities, which save his life more than once. He also holds a grudge against Folken for leaving his native kingdom of Fanelia for Zaibach and Dornkirk for his grand ambitions. As a child, he always admired Folken. Allen Schezar (アレン・クルゼード・シェザール, Allen Crusade Schezar?) is a member of the Knight Caeli, Asturia's elite knights who bears an uncanny resemblance to Hitomi's high school crush, Susumu Amano. When he was younger, his younger sister Celena was kidnapped by Zaibach, his father disappeared mysteriously, and his mother died shortly afterwards. He has captured the heart of Princess Millerna of Asturia, but also demonstrates strong feelings for Hitomi as the series progresses. He was a gifted swordsman at a young age, becoming one of the most skilled fighters of Gaea under the expert tutelage of Balgus of Fanelia. During his early knight career he and Princess Marlene fell in love and she bore his child, Chid. Later within the series, Allen briefly becomes romantically involved with Hitomi through Dornkirk's influence. Allen pilots the Guymelef Scherezade. Folken Fanel (フォルケン・ラクール・デ・ファーネル, Folken Lacour de Fanel?) the Strategos or tactician of Zaibach, Folken is revealed to be Van's older brother and the original heir to Fanelia. After he failed to kill a dragon, he lost an arm to the beast. However once he accepted the fact that he was going to die and that there was no malice or fear in his heart, the dragon left him alone consequently leading to his discovery that dragons were drawn to hatred and fear. He was later saved by the Zaibach, who nursed him back to health under Dornkirk's instructions and fitted him with a mechanical arm. He originally joined the empire in hopes of realizing Zaibach's ideals of a world free of war, but is later disillusioned and defects. Folken cares very much for Van's wellbeing and hopes that someday Van will stand by his side so they can create a peaceful world together. When they were younger Folken told Van the story of a man who slayed a "rampaging" dragon to protect his village which resulted in the man being chosen as the first king of Fanelia. After hearing this story, Van stated that killing the dragon was "mean" and Folken couldn't help but agree with him. It is later revealed that Folken only wanted to become king so Van's "gentle soul" wouldn't have to bear the pressure that came with the job. Folken is truly a kind individual that loves his brother more than anything and wishes for nothing but a peaceful future for all of Gaea. He, like Van, is half Draconian and thus he also has angelic wings. His wings have turned black, foreshadowing the destruction of his life is near. Folken dies when his sword breaks as he kills Dornkirk and strikes him in the heart. The last thing he said before his demise was "Van." Dilandau Albatau (ディランドゥ・アルバタウ, Dirandu Arubatau?) is the leader of an elite group of Guymelef pilots called the Dragon Slayers in Dornkirk's army. He almost completely lacks self-control, compassion, and a conscience. His greatest pleasures come from fighting and destruction, and the joy he takes in burning things suggests pyromania. In battle, Dilandau pilots a red Guymelef with flight capability, stealth cloak, flame-thrower and liquid-metal Crima Claw capabilities. As the series progresses, Dilandau grows gradually less stable. While clearly disturbed in his early appearance, his insanity grows after he receives a cut on the face during a fight with Van Fanel. Though he treats them very harshly, often slapping or hitting them for little or no reason, Dilandau is also emotionally dependent on the Dragon Slayers. After all of his men are killed, he becomes completely unstable and spends much of his time in an apathetic daze, only coming to life on the battlefield as he gleefully maims and kills. For their part, despite his harsh treatment, the Dragon Slayers are fanatically loyal to him, up to and beyond death. Towards the end of the series it is revealed he is actually Allen's lost sister, Celena (セレナ・シェザール, ? ), who was kidnapped, brainwashed and mutated into a male through a series of fate-altering experiments. In flashbacks of his childhood, it is revealed that Jajuka was Celena's caretaker when she first arrived in Zaibach and became Dilandau's emotional anchor. As his mental state deteriorates, Dilandau's memories try to return and he briefly returns to being Celena, though she is stuck in a naive, childlike state. During this time, Celena is reunited with Allen for a short time, but the Dilandau personality reemerges. During a climatic battle with Van, Jajuka is killed protecting Dilandau. Before he dies, he tells Dilandau it's okay to be Celena again, triggering Dilandau to revert to his real self again. Celena and Allen are reunited again, and the Dilandau personality is not seen again. Emperor Dornkirk (ドルンカーク, Dorunkaaku?) is the leader of Zaibach believed to be two hundred Earth years old and a former Earth scientist named Isaac. Isaac learned that physical attraction between matter is caused by the force of gravity. He thus believed that everything in the universe, including fate and destiny, is caused by a force and everything is governed by a universal law. His theories and discoveries led him into the invention of machines that can predict and change the future. Isaac was transported into Gaea and later became Emperor Dornkirk after "saving" the rural people of Zaibach with his knowledge. Dornkirk continually looks into the future with his Destiny Prognostication Engine in order to create an ideal future for Gaea by unlocking the secrets of Atlantis. 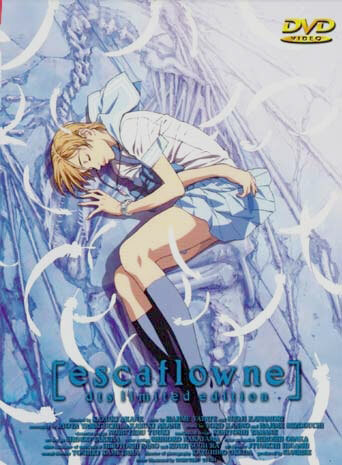 Hitomi's visions of the future and Van's connection to Escaflowne continually interfere with his efforts, however. The future he seeks to create is the "zone of absolute fortune", in which everyone's wishes would come true. However, it is that very power that destroyed Atlantis. Nearing the end of the series, Dornkirk had successfully constructed his device to generate the "zone of absolute fortune". It was activated upon his death at the hands of Folken, which was immediately followed by Folken's own demise, a consequence of the workings of the machine. Dornkirk, kept alive by various machinery in the first place, sticks around as an incorporeal ghost to see how his experiment would turn out. Upon the deactivation of his machine, he finally vanishes. Frequently hinted though never confirmed in the series, the character of Dornkirk was based on the historical figure Sir Isaac Newton. Series writer and director Shoji Kawamori noted that Newton studied alchemy, even writing a book on it, so he theorized Newton discovering the power of Atlantis. Balgus (バルガス, Barugasu?) is one of the three master swordsmen of Gaea and a general of Fanelia's army. Balgus served under Van's father in his younger days and later left to travel around Gaea, searching to improve his skills. He met Allen and trained him for a time, but when Van's father died he returned to Fanelia to look after Van and his mother. When Zaibach destroyed Fanelia, he died while saving Van. Though he perished early in the series he continues to affect the lives of the main characters through his lasting influence as both a mentor to Van and teacher to Allen. Merle (メルル, Meruru?) a 13-year-old cat-girl and childhood friend of Van. She is jealous of Van's increasingly close relationship with Hitomi, but eventually comes to accept Hitomi; and becomes a loyal friend to her. An orphan, she has since devotedly followed Van since she was picked up by the Fanelian courts. She never hesitates to protect Van at all costs (the twins Eriya and Nariya spared Van's life once when Merle hauled herself in front of him, seeing their past selves reflected on her). Millerna Aston (, Millerna Aston? ), the third princess of the kingdom of Asturia who is in love with Allen Schezar, though she is betrothed to the merchant prince Dryden Fassa. Millerna's ambition was once to become a doctor, but was forced to give up her medical studies by her second sister, Eries. Her eldest sister, Marlene, is deceased and was the wife of Duke Freid and the mother of Allen's son, Chid. She later runs away from Asturia to join Van's troupe and fulfill her dreams. She is upset by her engagement to Dryden, but gradually comes to appreciate her fianc? 's good qualities. At the end of the series, however, they separate on good terms, with Dryden saying "I will come back when I'm more deserving of you". Millerna then realizes that she can't depend on others to make her happy. ジャジュカ (Jajuka, ジャジュカ?) becomes the only soldier under Dilandau's command after the dragon slayers are killed in battle by Van. An former-servant of the Sorcerers who kidnapped Celena, he was responsible for her well-being as a child and genuinely cared for her, the two were almost inseparable. When Dilandau was returned to the sorcerers years later, Jajuka volunteered to fight beside him. Eries Aston (, Eries Aston?) is the second princess of Asturia and Millerna's older sister. She disapproves of Millerna's decision to be a doctor and attempts to discourage her younger sister from pursuing both the study of medicine and Allen Schezar. She also agrees to look after Allen's sister, Celena, when she mysteriously appears again, though it is soon discovered that Celena is actually Dilandau. Dryden Fassa (, Dryden Fassa?) is a knowledgeable, successful, and generous merchant who is also a part-time scholar. He is engaged to Millerna through his father Meiden, a friend of Asturia's king. He's perceptive and open-minded and well aware that Millerna is in love with Allen, yet he still flirts with her. Prince Chid (, Prince Chid?) is the heir to duchy of Freid and is supposedly the Duke of Freid and Princess Marlene's son, but his real father is Allen Schezar. After Duke of Freid died, Chid eventually became the Duke. When Princess Marlene had married Duke Freid, she never openly revealed the truth behind her pregnancy, but she wrote about it in a hidden diary that was later found by Millerna. Chid displays a strong connection and trust for Allen, though unaware of their true connection as father and son, and admires and hopes to live up to Duke Freid, the only father Chid has ever known. Though the Duke is apparently strict and unfeeling towards Chid, he recognizes Chid as his own son and cares for him deeply, despite the fact he deduced that Chid is not actually his son.